Waterproof up to 30 Meters (98 feet). The inner rubber band provides your action camera with extra protection. Press the buttons with ease and capture more fantastic pictures and videos underwater. Secure Protection. Adopted premium polycarbonate, the waterproof housing case ensures sturdy underwater use without damaging by the water pressure. Clear Shooting. High transmittance materials allow optimized picture clarity. No more worry about shadow that affects your pictures. Highly Adaptable. Compact and waterproof design enables you to fully enjoy diving, snorkeling and other underwater activities. 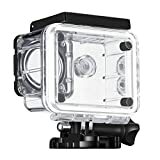 Waterproof housing case features lightweight and sturdy design. With housing waterproof to 30Meters (98 feet), you can capture more vivid videos underwater. Up to 30 meters (98 feet) waterproof design, allow you to capture perfect videos underwater. Suitable for various underwater activities such as diving, surfing, snorkeling and etc. Worry free to take vivid images with high transmittance materials. High quality polycarbonate stands with constant use without worry about the water pressure. Compatible with most action cameras including SJCAM SJ4000 and SJ4000 WIFI. This entry was posted in Discount Photography and tagged Action, Camera, Case, Cover, Housing, Protective, Sports, Underwater, VicTsing, Waterproof by Ball Photo. Bookmark the permalink.